The gorytos body needs to be carefully fitted to the spine. Mine required extra trimming since it was initially planned to wrap around a hidden spine. I used rubber cement rather than true contact cement, both because I was working indoors and because rubber cement allows the glued surfaces to be slid around a bit after contact rather than bonding instantly. Check again to be sure the bow fits and slides out easily enough without being too loose. 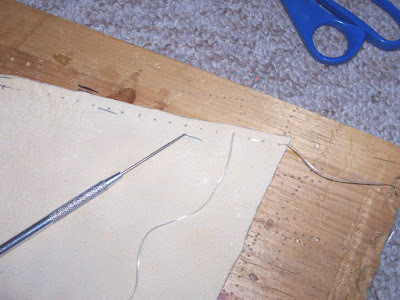 I marked for the line of stitching by pinching my thumb and forefinger together, putting one on the edge of the leather and pressing the other into the surface, then running them along the edge to make a shallow groove. 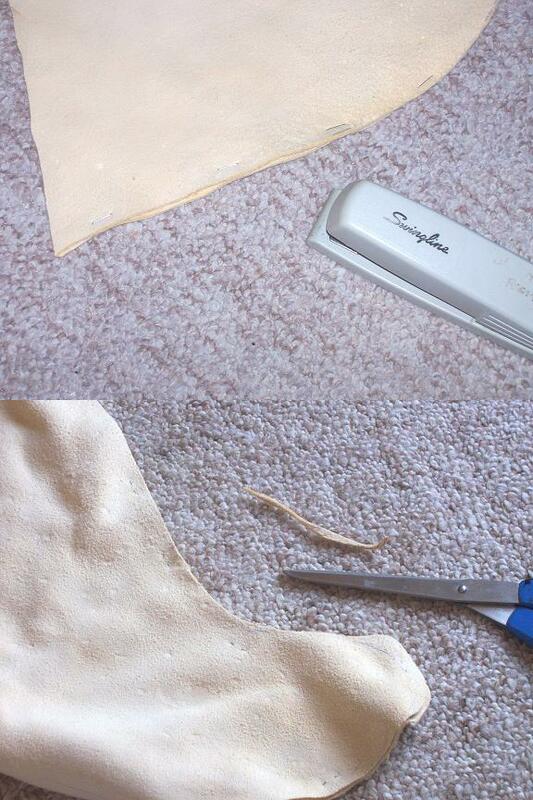 This is obviously not a method guaranteed to give nice neat results, but it worked tolerably well. I then marked for the stitch holes with a pen, 1cm apart. Drilling for stitch holes would've been much easier if I'd had a drill press, as holding a heavy power drill stable while pressing it down via a thin metal rod was precarious, and I broke one drill bit in trying to do so. The size of needle and artificial sinew I used worked best with a 5/64-inch bit. Not to mention a drill press would've allowed the holes on the back side to come out in a neater line. On the other hand, I soon found that the leather edge on the back was a little further back than on the front, so with the power drill I was able to angle the holes in slightly. In Greek art, gorytoi often feature a decorative crenelation and, on at least one example, a row of dots lined up with it. Such a design might have been appliquéd or done in hide glue paint. Although there's no way of knowing, it's possible that the gorytoi at Persepolis once featured such decoration as well. 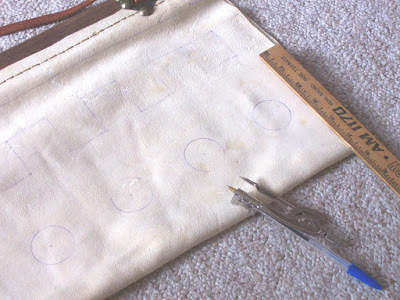 I worked up the design on mine lightly in ink, with a little calculating of the available space for each square and measuring to keep the dots exactly halfway between the squares and the gorytos' edge. The paint would go a little bit over the lines to cover them up. 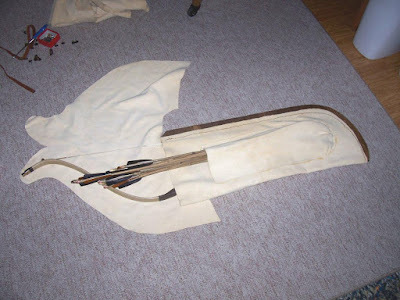 Finding the correct point of balance for the belt attachment required inserting the bow and full allotment of arrows and hanging the leather for the cover over the bow. I unfortunately failed to take any process photos while nailing the attachments down, which was a tricky process, especially on the back (having done the front first, the big domed tacks prevented the front from lying flat while I was nailing the attachments to the back, and the tacks kept shifting and bending). At this point, the bowcase would be functional and ready to take to the show, but not quite finished to the degree that I would like. Making the cover: The German-tanned buckskin is soft enough that it can be easily basted into place with a common desktop stapler (no, this is not a product endorsement). I based it with the slightly rougher side out, since I intend to invert it after stitching - the originals in art don't show any seams. 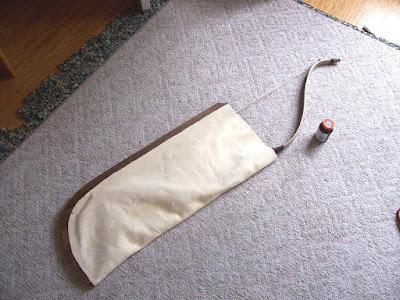 To prevent the fit over the bow from being too sloppy, the seam should be no wider than necessary, so some trimming can be done at this stage. I can't say I know for certain what a good width would be, as mine didn't turn out with a good precise fit anyway, but a quarter-inch seemed about right for strength. Mark the seam as above. Using more ink is fine, since it won't be visible on the finished cover. 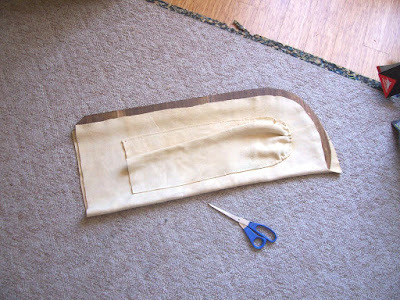 The stitch holes are a centimeter apart, though for light stitching like this, a closer spacing might be preferable. 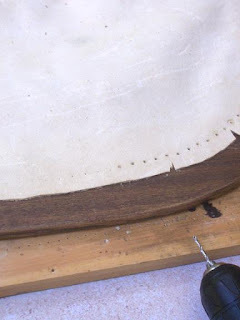 Without a thick slab of wood between the leather layers as on the bowcase's body, the stitch holes can be poked with a simple hobby awl. The finished product. Note the slightly sloppy fit of the cover. I should have made both it and the sloping top corner of the spine that it sits over a bit longer, so that the cover doesn't slip off the spine as readily, but all in all, I think it will prove sufficient.